A Sky Filled with Dippers! The Big and Little Dippers as seen at approximately 9:30 pm in October from mid-northern latitudes. This week, at around 8 p.m. local daylight time, the BigDipper – probably the best known star pattern – begins to pass under the northpole of the sky. If you live at or near latitude 30-degrees north (Tallahassee, New Orleans, Houston) the lower half of the Dipper's bowl is now in theprocess of descending below the horizon. Farther south, down to latitude25-degrees (the Florida Keys) the entire Dipper is sinking completely out ofsight. But if you're located anywhere north of 35-degreeslatitude, it's well worth locating a clear and unobstructed northern horizon tocatch the familiar Dipper at its most impressive: right side up and apparentlylooking much larger than normal thanks to the so-called "moon illusion." Actually, the sun and moon, as well as the constellations, always look much largernear the horizon than when they're high up. Yet, when measured or photographed,all celestial objects have exactly the same angular size whether high or low inthe sky. We humans have more experience in judging the size of objects whenlooking ahead than looking straight up, and things seen overhead seem smallerto us than when seen at the same distance horizontally. If the Big Dipper is too low for you to see, the LittleDipper is still visible (unless you're near the equator). And its currentorientation is such that it seems to be pouring its contents into its largercompanion. Of the two, the Little Dipper seems to more closelyresemble a soup ladle, although the late Kenneth Franklin, former ChiefAstronomer of New York's Hayden Planetarium, used to tell his audiences thatthe Little Dipper looked more like a meat cleaver. There are actually a few other dippers that are visible inour early evening sky. A really big dipper is approach the meridian high towardthe south. It's composed of the main stars of Pegasus,the Flying Horse, and Andromeda, the Princess. The Great Square of Pegasusmakes up the bowl, while the brightest string of stars from Andromeda form thehandle. If you want to extend the handle, then throw in Mirfak, the brighteststar of Perseus, the Hero. Those who live in the Southern Hemisphere are wellacquainted with an arrangement of four bright stars that closely resemble thefamous Southern Cross, known as the "False Cross." So why not, callthis Pegasus/Andromeda/Perseus arrangement the "False Dipper?" 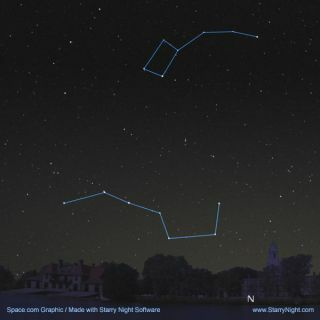 Another dipper can be found as darkness falls, low in thesouth-southwest in the constellationof Sagittarius, the Archer: a star pattern that was much more popular inthe star guides of former years – the "Milk Dipper." It's composed ofsome of the stars from the currently popular pattern known as the Teapot, plusone other star (Mu Sagittarii) above the lid of the Teapot. The Milk Dipperapparently got its name from the fact that it appears to be dipping intobrightest part of the Milky Way. And last, but by no means least, we have what some willmistake for the Little Dipper: the Pleiades star cluster. The main stars ofthis group indeed resemble a tiny skewed dipper, which is now rising ineast-northeast sky, heralding the impending arrival of the brilliant stars ofthe winter season.